On Thursday, Dec. 1st, the Union Democrat in my home of Sonora, California ran a half page story about me and my first novel, “Itara: Son of C’reseth.” I’d post a link, but it seem the Weekender page on the Union Democrat site is currently down. When my father called to tell me about the article, I squealed like a little girl and bounced around the office. This is the first time I’ve been featured as an author in a newspaper. It means so much more that the place of my upbringing is the first to give me this fine honor. A heartfelt ‘thank you,’ to everyone on the staff at the Union Democrat. You’ve given me a wonderful Christmas present. Were You At Comikaze 2011? If you were at the 1st annual Comikaze convention at the L.A convention center, you probably saw me ‘dashing’ around as the competitive attitude queen, Rainbow Dash. When I wasn’t being snagged for photo ops (which were all awesome! ), I busted out my own camera and took some shots. If you dressed up, I may have caught you in one of my pictures. I’ve put up the ones that turned out on my photobucket page. Check it out! If you find yourself, that’s great! If you can’t find yourself, seek therapy. Or just wait for yourself to come home from where ever you were. If you see yourself, please let me know and I will change the title on the picture. You can send me a direct message via the contact page on this site. 🙂 I’m not a professional photographer, but I do know how cool it feels to see a picture of yourself that someone snapped guerrilla style. ComicKaze has returned to Los Angeles! Now for a bit of nerdnip….. Mark Hamill will be there! SQUEE! Hence the photo on the comikaze home page. Congratulations. You officially got a sneak peak into my little hobby of cosplaying –however lightweight it may be. Although I am not a professional seamstress, I still have fun running around a convention center and posing for pictures as I show off my Hard Work and Guts! (less of the guts, though, I hope). 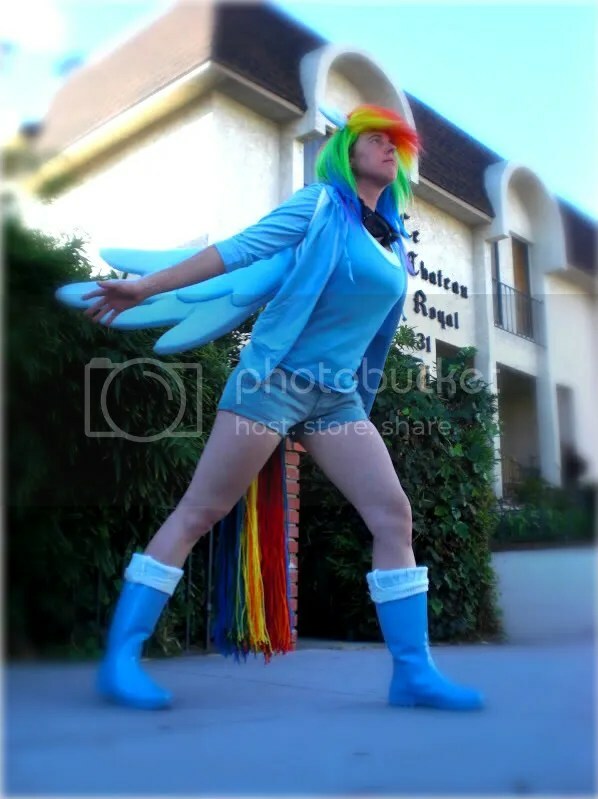 If you see me there in sky-blue clothes, rainbow hair, a colorful tail, and 3 foot wings, please stop and say hello! I’d love to hear if you’ve read my novel, or are planning to buy it, or get a stack of them for Christmas gifts. Masquerade@ 4pm, Sun 6th. Vote for Rainbow Dash!